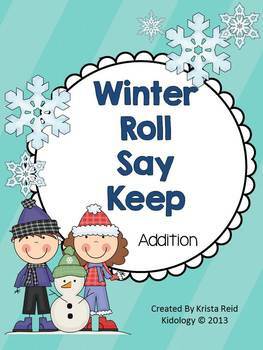 This is an addition version of the popular game Roll, Say, Keep with a winter theme. In this game students must solve single digit addition equations from the fact families one through ten This game is a great math center for partner pairs or small groups. 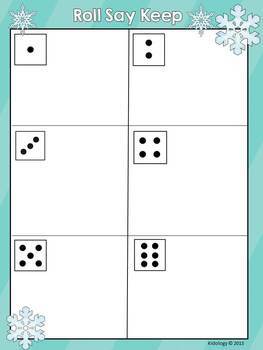 I have also sent this game home with students who require extra support with addition concepts. This download includes a roll, say, keep game board as well as 90 addition playing cards. The addition cards show one equation per card and you can choose as many or as few cards as you like for easy differentiation for varying skill levels within your class. 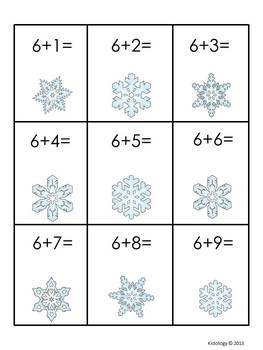 There are also two worksheets included as extension activities. 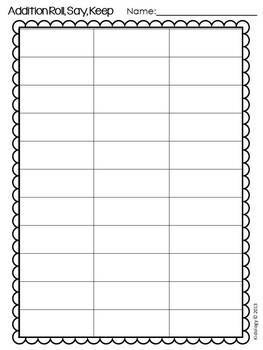 One worksheet is an addition worksheet giving students a review of some of the addition equations they encountered while playing, the other worksheet is blank and students can record the equations they solve while playing. Please download the preview for a sample of what is included with this download. Thanks so much for checking this out! Please don’t forget to leave feedback I really appreciate the feedback that I receive.